Two national news channels called on a regional daily’s chief reporter to provide eyewitness accounts of a fatal bus crash on his newspaper’s patch. 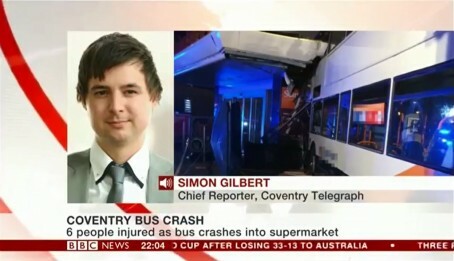 Both BBC News and Sky News interviewed the Coventry Telegraph’s Simon Gilbert from the scene of the crash, which claimed two lives. Simon was on the scene providing a live blog for the Telegraph’s website after the double decker bus crashed into a Sainsbury’s supermarket in Coventry city centre on Friday evening. Both Simon and the newspaper’s head of audience Dan Smith provided up to date coverage as the tragedy unfolded. Neither were on shift when the incident occurred. The Telegraph has since been praised for its “compassionate” coverage of the tragedy by readers. Said Simon: “This was an extremely difficult story to cover in incredibly emotional circumstances. “The fluid nature of the information, and the confusion surrounding the incident, made it all the more difficult to establish the facts of what had happened. “But I’m proud of the teamwork the Telegraph team demonstrated on the evening, and that we were able to use our contacts on the night to ensure our readers were kept updated in an accurate and speedy fashion.